Unfortunately, the Schumacher XP2260 1200 Peak Amp 6-in-1 Portable Power Station is no longer available. You can explore other items in the Jump Starters category yourself to try and find the perfect replacement for you! 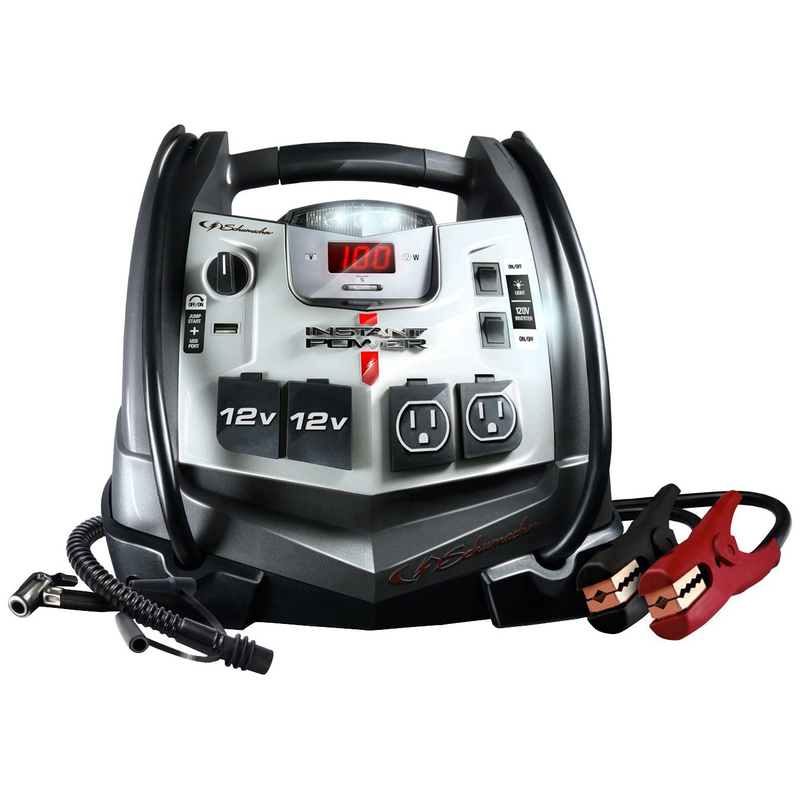 Schumacher XP2260 6-in-1 Jump Starter is a multifunction power station with a 1200 peak amp jump starter, tire inflator, 12V & 120V output, work lamp, and air mattress inflator. The XP2260 is a professional grade power station with the ease of use for consumer application. Never be stranded on the road again due to a flat tire or dead battery. The XP2260 has four different modes of output. (1) Industrial Grade Clamps, (2) 120V outputs, (2) 12V DC outputs, and (1) USB output for charging small portable devices like your cellphone or camera. The XP2260's ultra powerful jump starter can jump start most heavy duty batteries easily and quickly. Use the included high grade connector and clamps to attach to your dead battery. This Schumacher Instant Portable Power Source has an on/off switch that activates the jump start mode. A built-in charger for automatic charging of the internal battery; just connect an extension cord to the plug to recharge (cord not included). The battery status LEDs tell when a battery is charged or needs to be charged. The Sure-Grip Clamps fit both top and side-mount batteries. The cable will stay flexible in the coldest weather. A maintenance-free, sealed lead acid battery allow for storage in any position. Maintenance-Free Sealed Lead-Acid Battery allows storage in any position. Surge Capacity (Peak Power): 400 Watts Dimensions: 12 in. x 11.5 in. x 10.5 in.